The British Prime Minister addressed Parliament today. British Prime Minister David Cameron addressed Parliament today, saying that while he accepts the decision of voters to leave the European Union, Britain "must not turn its backs on Europe or the world." His speech followed what has been a tumultuous series of days for Britain and was intended in part to reassure investors in the economic stability of the U.K. as markets continued to tumble around the globe in reaction to the vote on a Brexit, or Britain's withdrawal from the E.U. The latest sign of the Brexit backlash was the announcement today from credit rating agency Standard & Poor's that it was downgrading its rating on the U.K. from AAA to AA. "In our opinion, this outcome is a seminal event, and will lead to a less predictable, stable, and effective policy framework in the U.K.," S&P said. Fitch Ratings also cut its forecast of the U.K.'s sovereign rating one notch to AA from AA+ and said its outlook on the region was negative. Cameron opened his speech by acknowledging that "adjustments with [Britain's] economy would have to be made" but said that "the decision must be accepted." He said he would not be triggering Article 50 of the Lisbon Treaty, which begins the process of withdrawal from the EU. That will be left to his successor in October. Cameron pledged to resign from his post after voters decided last week to leave the EU. He campaigned aggressively for Britain to remain in Europe after making the controversial decision to hold Thursday's referendum. U.K.'s Treasury Chief George Osborne sought to ease the global markets after the historic vote, saying the U.K. economy is firmly positioned to face the challenges ahead. "Today I want to reassure the British people and the global community that Britain is ready to confront what the future holds for us from a position of strength," he said during a news conference this morning. 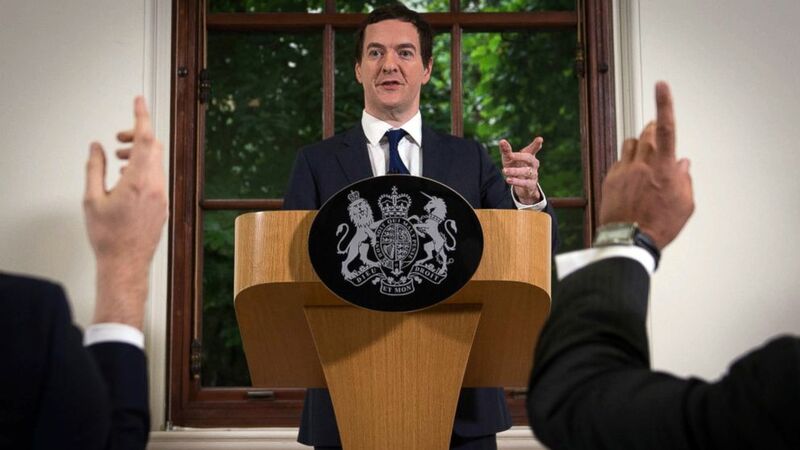 (Stefan Rousseau/AP) British Chancellor of the Exchequer George Osborne speaks during a press conference at The Treasury in London, June 27, 2016. "Growth has been robust. Employment rate is at a record high. The capital requirements for banks are 10 times what they were, and the budget deficit has been brought down from 11 percent of our national income and was forecast to be below 3 percent this year," he said. "I said we had to fix the roof so that we were prepared for whatever the future held, and thank goodness we did. As a result, our economy is about as strong as it could be to confront the challenge our country now faces." But his remarks were not enough to ease investors' concerns. The British pound dropped to its lowest level in 30 years Friday and fell an additional 2 percent against the U.S. dollar before Osborne's comments. The pound rebounded slightly after the speech. Friday's selloff wiped out $2.1 trillion in global markets, with the United States alone losing $830 billion. 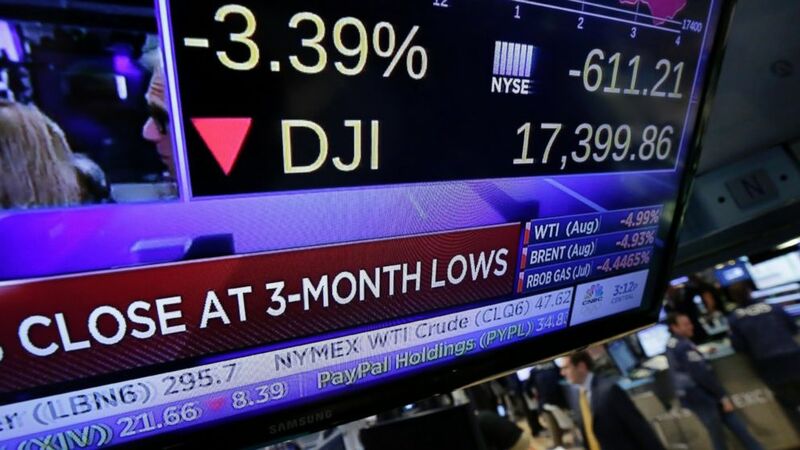 (Richard Drew/AP) A television screen on the floor of the New York Stock Exchange shows the closing number for the Dow Jones industrial average, June 24, 2016. U.S. markets continued their decline this morning. During an appearance on ABC's "This Week," Kim Darroch, the British ambassador to the United States, said that the U.K.'s position after the vote would not mean the nation is "disappearing from the world stage" and that it would remain "America's closest ally." "There's going to be a period of uncertainty while we work out this new relationship with Europe," he said. "But we are a strong country, a stable country. We will work it out in our usual pragmatic way. We will come through this, and we will end up as important a player on the international scene as we have been." The final tally in the Brexit referendum was 51.9 percent in favor of leaving to 48.1 percent for remaining — leaving many questioning the finality of the decision. By midday Sunday, more than 3 million people had signed an online petition asking for a new referendum. Darroch, however, described the Brexit decision as "irrevocable." 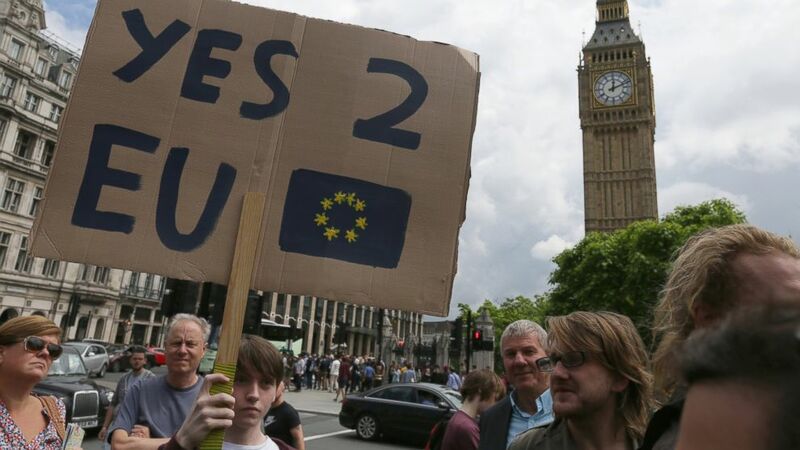 (Tim Ireland/AP) Demonstrators opposing Britain's exit from the European Union in Parliament Square following EU referendum result hold a protest in London, June 25, 2016. He said the "expectation" is that the ruling Conservative Party will elect a new leader by the end of September. "The prime minister made it clear throughout that this was a once-in-a-generation vote and the result was final," Darroch said. "The task for us now is to pull together and work out the new relationship with Europe." Meanwhile, the opposition Labour Party is also experiencing fallout over the EU referendum, as party leader Jeremy Corbyn continues to weather calls for his resignation. Today he announced new team members after 12 members of his shadow cabinet resigned on Sunday. He has mostly struck a tone of defiance in the face of criticism. On Saturday he tweeted that he was "elected Labour's Leader to redistribute power and wealth in this country." 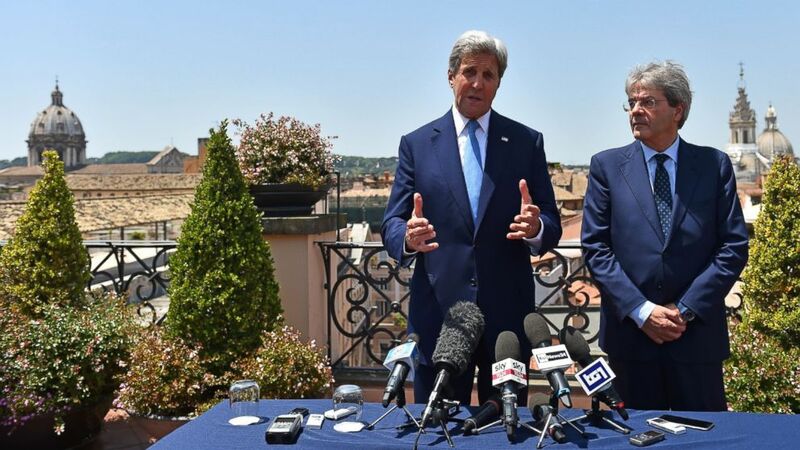 (Gabriel Bouys/AFP/Getty Images) US Secretary of State John Kerry (L) meets Italian Foreign minister Paolo Gentiloni in Rome on June 26, 2016. Cameron also used his speech to address concerns that hate crimes had escalated in the wake of the Brexit vote. The referendum was largely seen as a reaction to a wave of populist, anti-immigration sentiment growing in the British electorate. He said that his country "won't stand for hate crimes" and that they must be "stamped out."